Buspirone ( ), trade name Buspar, is an anxiolytic psychotropic drug of the azapirone chemical class. It is primarily used to treat generalized anxiety disorder (GAD). Unlike most drugs predominantly used to treat anxiety, buspirone's pharmacology is not related to benzodiazepines or barbiturates, and so does not carry the risk of physical dependence and withdrawal symptoms for which those drug classes are known. Buspirone was first identified by a team at Mead Johnson in 1972, but was not patented until 1975. In 1986, Bristol-Myers Squibb gained Food and Drug Administration (FDA) approval for buspirone in the treatment of GAD. The patent placed on buspirone expired in 2001 and buspirone is now available as a generic drug. Buspirone is approved in the United States by the FDA for the treatment of anxiety disorders and the short-term relief of the symptoms of anxiety. Likewise in Australia, buspirone is licensed for the treatment of anxiety disorders. In the United Kingdom, buspirone is indicated only for the short-term treatment of anxiety. Although not approved for this indication, studies such as impotence) of the SSRI. Several clinical trials, most randomised double-blind trials (and in one buspirone was used as an adjunct to atomoxetine) and one open-label, have been conducted to evaluate the utility of buspirone in the treatment of attention deficit hyperactivity disorder with mostly positive results. Buspirone is also used in the treatment of mild to moderate cerebellar ataxia. For generalized anxiety disorder (GAD): 15–60 mg. Starting dose is 5 mg, 3 times daily, average dosage being 20–30 mg a day. If symptoms still persist after several weeks then the dose may be titrated up to 60 mg. Due to Buspar's short half-life and linear pharmacokinetics, dosage can be increased by 5 mg every two to three days. The likely mechanism of the interaction caused by grapefruit juice is delayed gastric emptying or inhibition by a substance in grapefruit rind of cytochrome P450 3A4-mediated first-pass metabolism of buspirone. The occurrence of elevated blood pressure has been reported when buspirone hydrochloride has been added to a regimen including a monoamine oxidase inhibitor (MAOI). A study of acute morphine withdrawal in rats found that co-administration of Buspirone and morphine reduced synaptic ultrastructural changes in hippocampus leading to a reduction of anxiety and withdrawal symptoms. In a 1996 study, buspirone was shown to be effective as an augmentative agent for the treatment of alcohol dependence. Several studies have shown the administration of buspirone can improve spatial learning and memory function following a traumatic brain injury. New research is being conducted to test the antagonist properties of buspirone at both D3 and D4 receptors as a pharmacological treatment for cocaine dependence. In a 2007 study conducted on rats, buspirone showed a complete remission of haloperidol-induced tardive vacuous chewing symptoms when coadministered for five weeks. Positive results for the treatment of depression when buspirone was combined with melatonin has been shown. It is suspected that the method of action differs from SSRI medications. Preliminary research suggests that the combination of buspirone and melatonin stimulates the growth of new neurons in the brain, also known as neurogenesis. Buspirone has been studied as an adjunct in schizophrenia. Some neuroleptic drugs also act on 5-HT1A receptors and effects on the prefrontal cortex have been connected to clinical outcomes. Buspirone's efficacy is comparable to that of members of the benzodiazepine family in treating GAD, although it tends to have a delayed onset of action. Abrupt discontinuation of diazepam after six weeks of continuous administration resulted in withdrawal symptoms. This was not the case when administration of buspirone was ceased after six weeks. It may take several weeks before buspirone's anxiolytic effects become noticeable, and many patients may also need a higher dosage to adequately respond to treatment. Buspirone's chemical structure and mechanism of action are completely unrelated to those of benzodiazepines and is not effective as a treatment for benzodiazepine withdrawal. Unlike benzodiazepines, buspirone is not a drug of abuse. However, when snorted, buspirone is hallucinogenic, and is used this way in places such as prisons. ^ a b c d e "buspirone (Rx) - BuSpar, Buspirex, more..". Medscape Reference. WebMD. Retrieved 14 November 2013. ^ "Commonly Prescribed Psychotropic Medications". NAMI. Retrieved 25 June 2014. ^ a b c "BUSPIRONE HCL (buspirone hydrochloride) tablet [Watson Laboratories, Inc.]". DailyMed. Watson Laboratories, Inc. July 2013. Retrieved 14 November 2013. 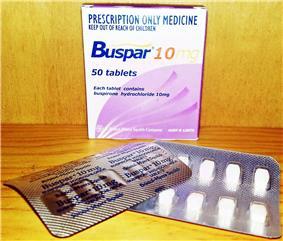 ^ a b c d "BUSPAR® (buspirone hydrochloride) Tablets 5 mg & 10 mg PRODUCT INFORMATION" (PDF). TGA eBusiness Services. Aspen Pharma Pty Ltd. January 2010. Retrieved 14 November 2013. ^ Rossi, S, ed. (2013). Australian Medicines Handbook (2013 ed.). Adelaide: The Australian Medicines Handbook Unit Trust. ^ a b c "Buspirone 10mg Tablets". electronic Medicines Compendium. Actavis UK Ltd. 10 September 2012. Retrieved 14 November 2013. ^ "The STAR*D Trial: First Results". Psych Central. The Carlat Psychiaty Report. Retrieved 15 September 2014. ^ National Institute Of Health. "Questions and Answers about the NIMH Sequenced Treatment Alternatives to Relieve Depression (STAR*D) Study — All Medication Levels". Retrieved 12 August 2012. ^ Trivedi MH, Fava M, Wisniewski SR, Thase ME, Quitkin F, Warden D, Ritz L, Nierenberg AA, Lebowitz BD, Biggs MM, Luther JF, Shores-Wilson K, Rush AJ (March 2006). "Medication augmentation after the failure of SSRIs for depression". N. Engl. J. Med. 354 (12): 1243–52. ^ Appelberg BG, Syvälahti EK, Koskinen TE, Mehtonen OP, Muhonen TT, Naukkarinen HH (June 2001). "Patients with severe depression may benefit from buspirone augmentation of selective serotonin reuptake inhibitors and in a Class of Drugs called Benzodiazepines and effects similar if not idenical to Alprazelam,Lorazepam etc : results from a placebo-controlled, randomized, double-blind, placebo wash-in study". J Clin Psychiatry 62 (6): 448–52. ^ Malhotra S, Santosh PJ (April 1998). "An open clinical trial of buspirone in children with attention- deficit/hyperactivity disorder". Journal of the American Academy of Child and Adolescent Psychiatry 37 (4): 364–371. ^ Mohammadi MR, Hafezi P, Galeiha A, Hajiaghaee R, Akhondzadeh S (November 2012). "Buspirone versus Methylphenidate in the Treatment of Children with Attention- Deficit/ Hyperactivity Disorder: Randomized Double-Blind Study". Acta Medica Iranica 50 (11): 723–728. ^ Sutherland SM, Adler LA, Chen C, Smith MD, Feltner DE (Apr 2012). "An 8-Week, Randomized Controlled Trial of Atomoxetine, Atomoxetine Plus Buspirone, or Placebo in Adults With ADHD". The Journal of Clinical Psychiatry 73 (4): 445–450. ^ Davari-Ashtiani R, Shahrbabaki ME, Razjouyan K, Amini H, Mazhabdar H (Dec 2010). "Buspirone Versus Methylphenidate in the Treatment of Attention Deﬁcit Hyperactivity Disorder: A Double-Blind and Randomized Trial" (PDF). Child Psychiatry and Human Development 41 (6): 641–648. ^ "The relationship between buspirone bioavailability and dose in healthy subjects". Wiley Online Library. Biopharmaceutics & Drug Disposition. ^ List, RX. "Buspar Dosage". RX List. Retrieved 25 August 2014. ^ "Clinical Effects of the 5-HT1A Partial Agonists in Depression: A Composite Analysis of Buspirone in the Treatment of Depression.". Journal of Clinical Psychopharmacology:. ^ "Buspirone, a novel nonbenzodiazepine anxiolytic.". Clinical Pharmacy. ^ "Clinical Studies of Buspirone". Psychopathology. ^ "Effects of Buspirone on Agitation Associated With Dementia". The American Journal of Geriatric Psychiatry. ^ "Metabolism and disposition of buspirone". The American Journal of Medicine. ^ "The comparative efficacy of buspirone and diazepam in the treatment of anxiety.". The American Journal of Psychiatry. ^ a b c d e f "Buspirone monograph". Drugs.com. Retrieved 2011-08-27. ^ Geddes, John; Gelder, Michael G.; Mayou, Richard (2005). Psychiatry. Oxford [Oxfordshire]: Oxford University Press. p. 237. ^ Lilja JJ, Kivistö KT, Backman JT, Lamberg TS, Neuvonen PJ (1998). "Grapefruit juice substantially increases plasma concentrations of buspirone*". Clinical Pharmacology & Therapeutics 64 (6): 655–660. ^ Fulton B, Brogden RN (January 1997). "Buspirone" (PDF). CNS Drugs 7 (1): 68–88. ^ Blier P, Bergeron R, de Montigny C (1997). "Selective Activation of Postsynaptic 5-HT1A Receptors Induces Rapid Antidepressant Response". Neuropsychopharmacology 16 (5): 333–338. ^ Zuideveld KP, Rusiç-Pavletiç J, Maas HJ, Peletier LA, Van der Graaf PH, Danhof M (December 2002). "Pharmacokinetic-pharmacodynamic modeling of buspirone and its metabolite 1-(2-pyrimidinyl)-piperazine in rats". J. Pharmacol. Exp. Ther. 303 (3): 1130–1137. ^ a b "Efficacy of buspirone for attenuating cocaine and methamphetamine reinstatement in rats.". Drug Alcohol Dependence. Virginia Commonwealth University School of Medicine. Retrieved 5 March 2013. ^ "Role of α 1-adrenoceptors in the reduction of external carotid blood flow induced by buspirone and ipsapirone in the dog". Retrieved 17 September 2014. ^ Maximiliano Marquez. "Pharmacological evidence for interactions between 5HT1A receptor agonists and subtypes of α1-adrenoceptors on rabbit aorta". Retrieved 17 September 2014. ^ Manfrid Eltze, Helga König, Brigitte Ullrich,Thomas Grebe. "Buspirone functionally discriminates tissues endowed with α1-adrenoceptor subtypes A, B, D and L". Retrieved 17 September 2014. ^ Uvnäs-Moberg K, Hillegaart V, Alster P, Ahlenius S (1996). "Effects of 5-HT agonists, selective for different receptor subtypes, on oxytocin, CCK, gastrin and somatostatin plasma levels in the rat". Neuropharmacology 35 (11): 1635–1640. ^ Chiodera P, Volpi R, Capretti L, Caffarri G, Magotti MG, Coiro V (April 1996). "Different effects of the serotonergic agonists buspirone and sumatriptan on the posterior pituitary hormonal responses to hypoglycemia in humans". Neuropeptides 30 (2): 187–192. ^ Roth, BL; Driscol, J (12 January 2011). Database"i"PDSP K. Psychoactive Drug Screening Program (PDSP). University of North Carolina at Chapel Hill and the United States National Institute of Mental Health. Retrieved 14 November 2013. ^ "Buspirone Ameliorates the Morphine Withdrawal-Induced Anxiety through Synaptic Ultrastructural Changes in Hippocampus of Rat". Jialin Gao, Gang Qian, Suyuan Luo, Yan Tian, Mingsong Wu, Zhongxiang Yao. Retrieved 23 February 2014. ^ Malec TS, Malec EA, Dongier M; Malec; Dongier (1996). "Efficacy of buspirone in alcohol dependence: A review". Alcoholism, clinical and experimental research 20 (5): 853–858. ^ Olsen AS, Sozda CN, Cheng JP, Hoffman AN, Kline AE; Sozda; Cheng; Hoffman; Kline (July 2012). "Traumatic Brain Injury-Induced Cognitive and Histological Deficits Are Attenuated by Delayed and Chronic Treatment with the 5-HT(1A)-Receptor Agonist Buspirone". J. Neurotrauma 29 (10): 1898–907. ^ Cheng JP, Hoffman AN, Zafonte RD, Kline AE; Hoffman; Zafonte; Kline (December 2008). "A delayed and chronic treatment regimen with the 5-HT1A receptor agonist 8-OH-DPAT after cortical impact injury facilitates motor recovery and acquisition of spatial learning". Behav. Brain Res. 194 (1): 79–85. ^ Bergman J, Roof RA, Furman CA, Conroy JL, Mello NK, Sibley DR, Skolnick P; Roof; Furman; Conroy; Mello; Sibley; Skolnick (July 2012). "Modification of cocaine self-administration by buspirone (buspar®): potential involvementof D3 and D4 dopamine receptors". Int J Neuropsychopharmacol 16 (2): 1–14. ^ "Effects of Chronic Buspirone Treatment on Cocaine Self-Administration". Neuropsychopharmacology (Harvard Medical School) 38: 455–67. Feb 2013. ^ Haleem DJ, Samad N, Haleem MA; Samad; Haleem (May 2007). "Reversal of haloperidol-induced tardive vacuous chewing movements and supersensitive somatodendritic serotonergic response by buspirone in rats". Pharmacol. Biochem. Behav. 87 (1): 115–21. ^ Fava, M; Targum, SD; Nierenberg, AA; Bleicher, LS; Carter, TA; Wedel, PC; Hen, R; Gage, FH; Barlow, C (December 2012). "An exploratory study of combination buspirone and melatonin SR in Major Depressive Disorder (MDD): a possible role for neurogenesis in drug discovery". J Psychiatr Res 46 (12): 1553–63. ^ Biotech, Xconomy. "BrainCells Inc. Maps Out Next Steps for Novel Depression Drug". Xconomy. Retrieved 21 September 2012. ^ New Research Approaches for Mental Health Interventions, NCDEU. "A Pilot Study of a Novel Drug Combination in Major Depressive Disorder" (PDF). NCDEU. Retrieved 21 September 2012. ^ Celada, Pau; Bortolozzi, Analía; Artigas, Francesc (Sep 2013). "Serotonin 5-HT1A receptors as targets for agents to treat psychiatric disorders: rationale and current status of research". CNS drugs 27 (9): 703–716. ^ Cohn JB, Rickels K; Rickels (1989). "A pooled, double-blind comparison of the effects of buspirone, diazepam and placebo in women with chronic anxiety". Current Medical Research and Opinion 11 (5): 304–320. ^ Goldberg HL, Finnerty RJ; Finnerty (1979). "The comparative efficacy of buspirone and diazepam in the treatment of anxiety". The American Journal of Psychiatry 136 (9): 1184–1187. ^ Murphy SM, Owen R, Tyrer P; Owen; Tyrer (1989). "Comparative assessment of efficacy and withdrawal symptoms after 6 and 12 weeks' treatment with diazepam or buspirone". The British journal of psychiatry : the journal of mental science 154 (4): 529–534. ^ Sontheimer DL, Ables AZ; Ables, A. Z. (2001). "Is imipramine or buspirone treatment effective in patients wishing to discontinue long-term benzodiazepine use?". The Journal of family practice 50 (3): 203. ^ Wu, Y. H.; Ferguson, J. W.; Kissel, L. E.; Ferguson, H. C.; Kissel, J. W. (May 1972). "Psychosedative agents. 2. 8-(4-Substituted 1-piperazinylalkyl)-8-azaspiro(4.5)decane-7,9-diones". J. Med. Chem. 15 (5): 477–479.